By Euro-ZOne standards it seemed a blessedly straightforward affair. At the relatively civilised hour of 8.30pm Friday night the Eurogroup of euro-zone finance ministers agreed to extend Greece’s second bail-out, which was due to expire on February 28th, by four months. A deal had hardly been assured. Two previous Eurogroups had ended rancorously, and a spat between the Greek and German governments on February 19th had soured the mood further. Jeroen Dijsselbloem, the group’s chairman, began yesterday by downplaying expectations. But by the evening, after having successfully brokered discussions between the Greeks, the Germans and the European Commission, he was able to describe the outcome as “very positive”. (A recent acceleration in deposit outflows from Greek banks appears, in part, to have forced Athens’s hand.) The extension should unlock the funding Greece needs to stay afloat over the coming months and, at least for now, quiet talk of its departure from the euro. That is the good news. But euro-pessimists never have to look hard to bolster their case. The doubts begin with the terms of last night’s deal. By Monday the Greek government must present a list of reforms it intends to carry out under the terms of the bail-out extension. The European Commission, European Central Bank and the IMF—once known as the “troika”, now renamed the “institutions” in a gesture to Greek semantic sensitivities—must give their assent. 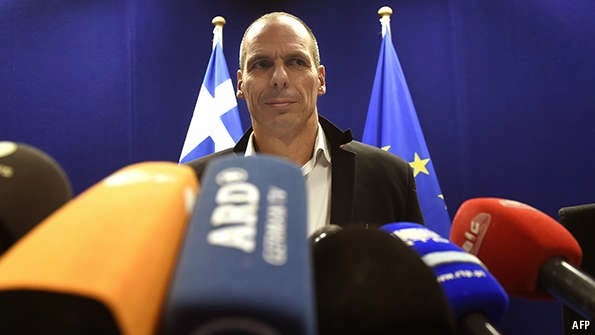 If they do not, said Yanis Varoufakis (pictured), Greece’s finance minister, “the deal is dead”. The arrangement does at least allow the Greeks to reclaim some authorship of their country’s policies, but in reality they are likely to have to make some painful concessions, over pension reform, for example. It will be a busy weekend in Athens.